First remove the peeling, then chop and prepare as you would a potato or eat it raw in salads. Kohlrabi: The taste and texture of kohlrabi are similar to those of a broccoli stem or cabbage heart, but milder and sweeter. Cook it as you would a potato: roast, stir fry, puree and use soups, shred and put in salads or slaws. To Prepare: When you get home separate the leaves from the bulbs. The leaves will wilt and only last for a few days while the un peeled kohlrabi bulb will stay in your fridge for a week or two. Store the leaves in a sealed ziplock plastic bag. The un peeled bulbs can be stored in your produce drawer or you can go ahead and prep them by peeling them and putting them in a plastic bag so they are easily ready to cut and use. The leaves are also entirely edible, Chiffonade them finely and toss them in a vinaigrette. Chiffonade is the name of the technique in which you stack the leaves, rolling them tightly, then slicing the leaves perpendicular to the roll to make long, thin strips (who knew it actually had a name for that technique). You can also rough chop and steam or sauté them, like collard greens or kale. 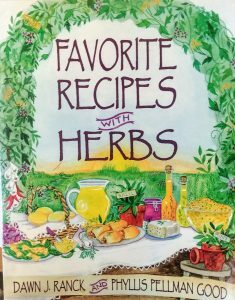 Dill: This member of the Apiaceae (aromatic flowering plants) family, and relative to celery, carrot and parsley loves to stay fresh in a jar on your kitchen countertop. If you put it in the fridge it will wilt almost instantly. Treat it as you would cut flowers changing the water daily and your dill will remain fragrant and lovely for a week. It makes a great salad dressing, dip or sprinkle it over your french fries. Let stand for at least one hour before serving. Store refrigerated for 4-5 days. Scallions- While Chives and Scallions are not the same vegetable they are almost identical in taste and can be used in substitution for each other. Chives are generally smaller and more slender with a milder flavor. Use the scallions in dips, spreads or garnish over soups and eggs. Delicious veggie cream cheese spread for your morning bagel, croissant or crackers. Mix cream cheese and herbs until well blended. Store in the refrigerator for up to a week. Snow Peas- Bright green snow peas – often used in Asian stir-fries – are not to be confused with snap peas. Both are part of the legume family of sugar peas and have edible pods. 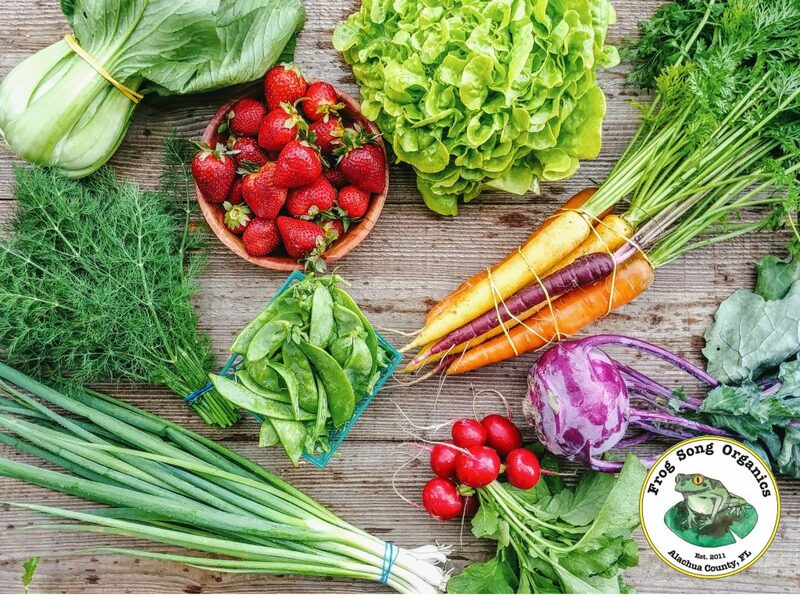 Very versatile and one of the easiest vegetables to prepare, snow peas can be enjoyed au natural, added to salads, served raw with any kind of dip, or sautéed and buttered. Before cooking or eating them rinse them in water, then crack the tip of each snow pea and pull out the tough string that runs along its side (optional). No matter how you cook them – boiling, steaming, stir-frying or blanching – snow peas need only one to three minutes. 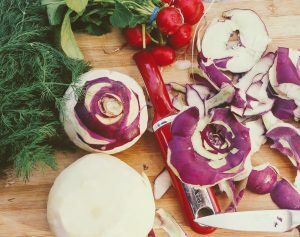 Quick cooking will also retain their vibrant color and vitamins. 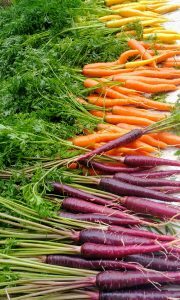 Rainbow Carrots- Delicious colorful carrots just in time for easter brunch. 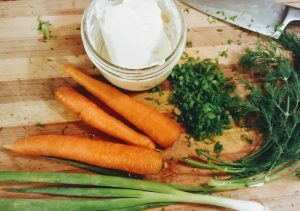 I don’t have to tell you how to eat a carrot but you might find this article useful for it’s lush, feathery locks.. 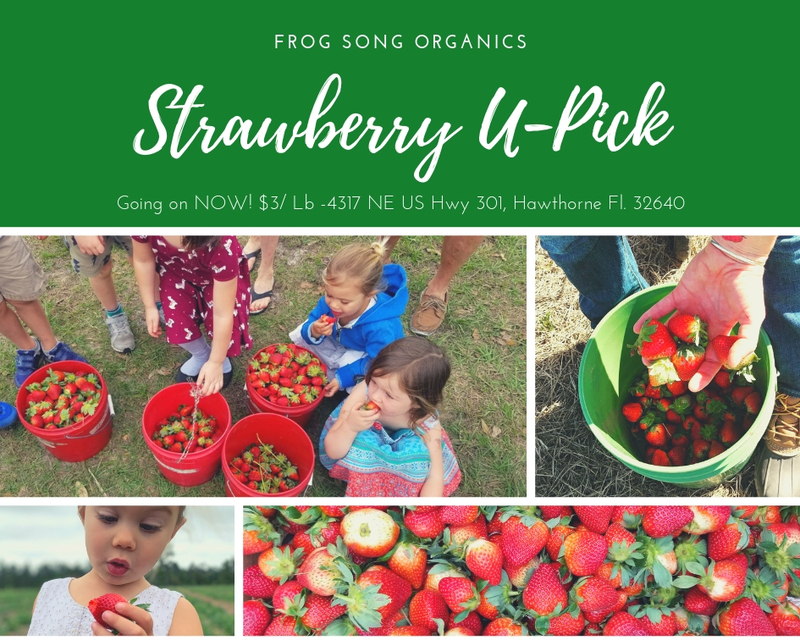 Strawberry U-Pick Going on NOW!!! Cash or Check only please! Check out our Facebook Page for more details.